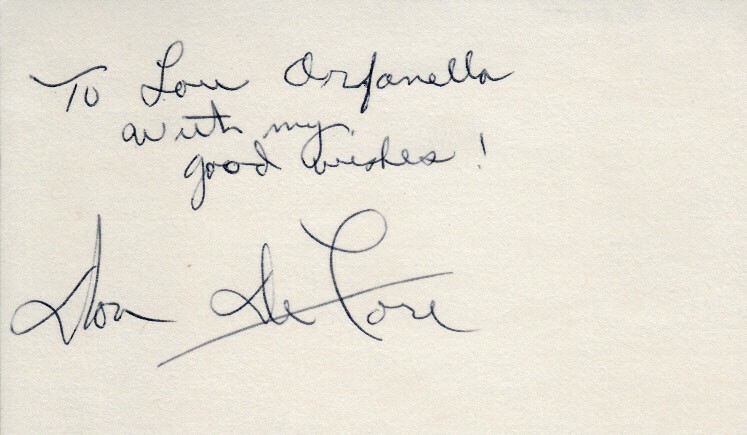 3x5 index card autographed in blue ballpoint by the late actor Don DeFore inscribed To Lou Orfanella with my good wishes! (could be easily matted or trimmed out), who passed away in 1993. 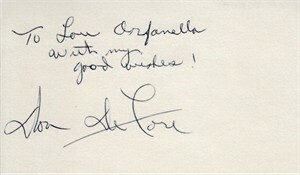 DeFore is best remembered for his sitcom roles as Erskin (Thorny) Thornberry on The Adventures of Ozzie and Harriet and as George (Mr. B.) Baxter on Hazel. With certificate of authenticity from AutographsForSale.com. ONLY ONE AVAILABLE FOR SALE.